I'm experiencing extreme ping spikes to my AirPort Extreme (local IP: 192.168.1.1), however I am not getting these ping spikes on another MacBook Pro right next to it. Here are my ping results. I'm posting this reply on a few threads to make it easier to find. I chased the same issue and finally found the cause. Locationd. Open the console app and watch while you do a continuous ping. Every time you see latency spike, you'll see entries for locationd. Go to system prefs->security & privacy->location servers. From there, you can disable and you'll likely see the problem disappear. However, you lose the "find my mac" ability. What made mine acceptable was going to system services (scroll down)->details->check show icon in menu bar when [...]. Then, take look at what is requesting location. Disallowing Evernote helped a lot. I pruned down to the minimum and the frequency of the spikes has gone down to an acceptable level for me. edit: filed a bug with Apple because even when location services are disabled, locationd scans (verified in console), impacting latency. Apple marked it as a dupe, so hopefully fixed soon. As mentioned by others, WiFi spikes are typically caused by WiFi daemon scanning another WiFi networks around. The scanning goes through all channels so if the current receiving channel is not the same as your AP is transmitting, you have a ping spike. The scanning is usually triggered by location services. 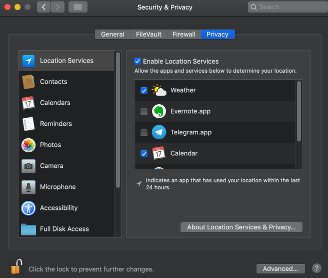 You can review the location services in: System Preferences -> Security & Privacy -> Privacy tab -> Location Services. 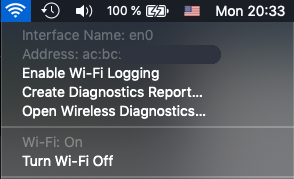 If you go to Advanced check the Show location icon in the menu bar... to see when the apps are querying location thus scanning WiFi neighborhood. Location services were still active because of System services. Mainly Time Zone & System Customisation and Significant Locations. But after turning that off I still had a WiFi glitch in spite of that Location setting window showed no other application acquiring the location. You need to enable WiFi logging to see why is WiFi daemon doing the scan. Hold option/alt key (next to the command key) and click WiFi icon in the top toolbar. Click Enable Wi-Fi Logging. Now observe ping terminal and wifi log terminal next to each other. You can clearly see the glitch occurrs precisely when WiFi is doing the scan. This solved my problem. The Texstudio was not mentioned in the location services list so this advanced approach was necessary. Execute in terminal: tail -f /var/log/wifi.log, in a new window. Observe side by side, wait for glitch. Check the log when the glitch was observed, kill the program. This script checks for Signal/Noise ratio. You probably have some interference. From my experience, in 90% of all cases, restarting the router will fix the issue. In my case, it was an app for taking screenshots. I detected it by doing the following: I ran ping command and was closing apps one by one, then I noticed after closing this app, ping spikes had gone. I have tracked similar problems to Airplay/Bonjour, ping spikes while airplay is in use or being checked. I believe this behaviour is actually linked to the bluetooth of the device being linked with the wireless adapter in the device. I am going to conduct some more tests soon and submit an apple bug report. if you keep bluetooth disabled you will probably find you will get no ping spikes. Not the answer you're looking for? Browse other questions tagged network wifi airport . What is causing slow Wi-Fi speeds on my Airport Extreme? Is intermittent high ping an issue in my Macbook or my router?